Mechanical Handling Ltd, Woodville, South Australia was awarded a contract in 1971 to, construct 40 narrow gauge 47 foot flat wagons, which were classified "NRN" and allocated road numbers 1702 through 1741. Some of the NRN wagons were recoded as AQNA. Of these 32 in 1980/81 were sent to Tasmania were they became the FV class. They were later recoded as the QL class. Narrow gauge 47 foot flat wagon constructed by Mechanical Handling Ltd.
12.8.1971 Entered service as narrow gauge "NRN" flat wagon. 5.1981 On Central Australia Railway. 20.7.1971 Entered service as narrow gauge "NRN" flat wagon. 11.6.1971 Entered service as narrow gauge "NRN" flat wagon. 18.6.1971 Entered service as narrow gauge "NRN" flat wagon. 1.1980 Written off on Central Australia Railway. 10.6.1971 Entered service as narrow gauge "NRN" flat wagon. 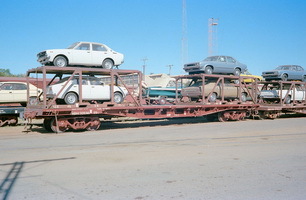 1.1978 Transferred from North Australia Railway to Central Australia Railway. 1.1978 Written off on Central Australia Railway. 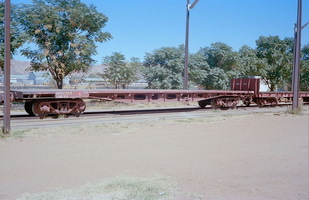 1.1980 Shown on Central Australia Railway inventory. 25.6.1971 Entered service as narrow gauge "NRN" flat wagon. 6.10.1971 Entered service as narrow gauge "NRN" flat wagon. 2.1977 Transferred from North Australia Railway to Central Australia Railway. 30.6.1971 Entered service as narrow gauge "NRN" flat wagon. 6.7.1971 Entered service as narrow gauge "NRN" flat wagon. 7.7.1971 Entered service as narrow gauge "NRN" flat wagon. 17.8.1971 Entered service as narrow gauge "NRN" flat wagon. 26.7.1971 Entered service as narrow gauge "NRN" flat wagon. 21.7.1971 Entered service as narrow gauge "NRN" flat wagon. 9.7.1971 Entered service as narrow gauge "NRN" flat wagon. 12.7.1971 Entered service as narrow gauge "NRN" flat wagon. 8.7.1971 Entered service as narrow gauge "NRN" flat wagon. 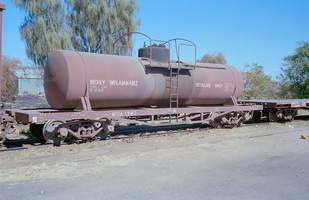 - Used on Civil Eng Breakdown Train, Port Augusta. 30.7.1971 Entered service as narrow gauge "NRN" flat wagon. 15.10.1971 Entered service as narrow gauge "NRN" flat wagon. 13.8.1971 Entered service as narrow gauge "NRN" flat wagon. 9.8.1971 Entered service as narrow gauge "NRN" flat wagon. 14.8.1971 Entered service as narrow gauge "NRN" flat wagon. 14.9.1971 Entered service as narrow gauge "NRN" flat wagon. 29.10.1971 Entered service as narrow gauge "NRN" flat wagon. 1977 Transferred from North Australia Railway to Central Australia Railway. 2.1979 Transferred to standard gauge as "RP 3197". 1.11.1971 Entered service as narrow gauge "NRN" flat wagon. 30.9.1971 Entered service as narrow gauge "NRN" flat wagon.